Established as a Canadian corporation January 20th 1992, 2017 marks the silver anniversary of Tigercat. Starting out as a small company with a single prototype and no distribution, Tigercat has come a long way in just 25 years. The design of the first prototype machine, the 726 drive-to-tree feller buncher, started in 1991. “We began designing the 726 in the fall of 1991 with a goal to have it completed and ready to exhibit at a live, in-woods show in Quitman, Georgia in April 1992. Although lacking some finishing touches, such as finding a location for the batteries, which we had temporarily secured with bungee cords under the engine, we loaded it on a truck and set out for the southeast USA,” recalled Tigercat president, Tony Iarocci. Don Snively, now district manager for Georgia and Florida, toured the prototype machine around the US for forty days until a logger took a leap of faith and it found a home at Williston Timber in north Florida. “The 726 established a foundation for the company to develop from and allowed Tigercat to gain respect in the marketplace,” explained Tony. To commemorate the silver anniversary, Tigercat acquired the prototype machine from Williston Timber, brought it home and restored it so that it can live on for decades to come. Hint: watch 25. 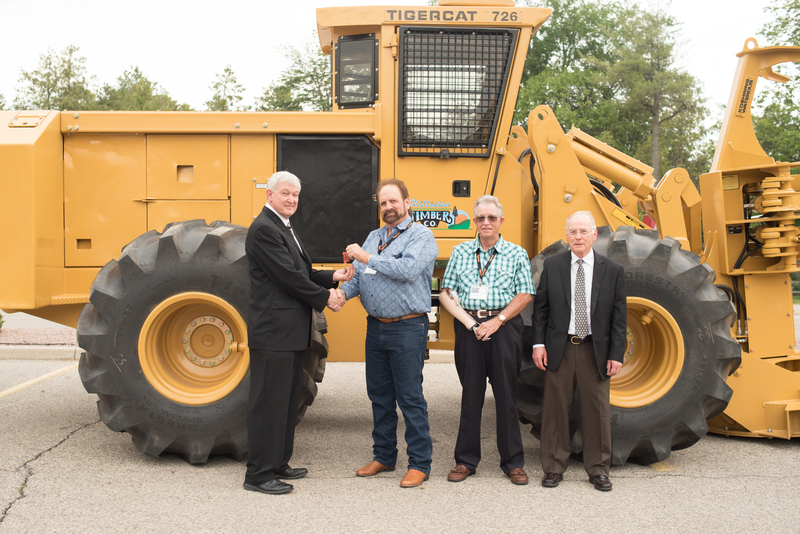 The unveiling of the rebuilt prototype 726 drive-to-tree feller buncher took place at Tigercat’s 25-year party at Bingemans Conference Centre in Kitchener, Ontario, where over 1,500 people attended to help celebrate the special milestone. Tigercat employees and dealers from all over of the world were in attendance including guests from Australia, New Zealand, Russia, South Africa, Brazil, Chile and of course the United States and Canada. The evening started out with guests taking group photos in front of the rebuilt prototype and with Eddie Hodge of Williston Timber giving the machine keys over to CEO Ken MacDonald and president Tony Iarocci. “I am happy to see the machine returning home where it belongs,” stated Eddie. As guests walked into the building, there was an entire room dedicated to a Tigercat gallery, showcasing archived photos of Tigercat team members, trade magazine articles, early advertisements and other items representing the various milestones and events that have taken place throughout the 25-year history. The gallery was the perfect spot to share memories and laugh about the good old days. After guests mingled and reminisced, dinner started with Bobby Goodson blessing the meal. The tables were decorated Tigercat-style with die cast machine models, decorative wood slices and ferns. Tony started off the speeches for the evening, touching on how the company came to be and drawing on some key memories from the early days. Tony thanked dealers and employees for all their support and hard work over the years, followed by a big thank you to the customers. Honourable mentions went out to the first two customers that took the leap of faith, Williston Timber of Williston, Florida and Clary Logging of Cordele, Georgia as well as deceased but never forgotten family members Johnny Hodge (Eddie’s brother and business partner) and Toogie Clary, Robert Clary’s son. Swamp Loggers star, Bobby Goodson, attended with wife, Lori. Bobby’s brother Mike Goodson and wife Cathy were in attendance, along with Bobby’s son Justin and his wife Bethany. Bobby spoke to the crowd, sharing some of his experiences as a logger, talking about his first awareness of Tigercat and how Tigercat came to play a significant role in his life over the years. Owners of Russian dealer, Forestry Machines, Yuriy and Yana Torokhov surprised Tigercat with a short film of a traditional Russian balalaika quartet that played a few Beatles tunes to honour Tigercat’s milestone. Communications manager, Paul Iarocci, introduced a film to commemorate the silver anniversary milestone, aptly titled, 25. The 35 minute film brought laughter and tears and finished with standing applause. Ken MacDonald closed off the night with a very emotional speech thanking everyone for their hard work and dedication. A special thank you was given to his family, while his proud father watched from the front row. Design and manufacturing excellence, dedication to the customer, vision, perseverance and teamwork have advanced Tigercat from a single prototype to where it is today. “I am overjoyed that the world record holders for harvesting and extraction and almost all of the top loggers and forestry companies already use our equipment. I find the greatest pleasure in working with them to create the optimal harvesting solutions and seeing them succeed,” says CEO Ken MacDonald. Now, offering over 50 different machine models, having produced 19,000 machines and counting, Tigercat has grown into a global success story – by helping its customers to succeed. With an employee count of 1,400 and over 150 independent dealer locations worldwide, Tigercat has accomplished what many thought to be unimaginable in just 25 years. Eddie Hodge hands the keys to the prototype 726 back to Ken MacDonald and Tigercat after 25 years. Robert Clary and Tony Iarocci look on. CEO Ken MacDonald spoke from the heart to conclude the formal part of the event. Eddie and Julie Hodge with Rose and Robert Clary. Over 1500 attended the 25 celebration.